On December 18, 2016, David and Jennifer Sparks hosted an "Ugly Sweater" competition at their house. They invited the entire Church to bring a finger food and come to their house for Christian fellowship as we ate a meal together and enjoyed each other's company. The night started off with some great food as everyone brought their favorite finger food. David and Jennifer had prepared a lot of good food in addition to what everyone brought. After everyone was finished eating, David was the emcee to the "Ugly Sweater Competition". Everyone who was not entered were the judges. David said that the judging should be based on the model's "performance" as much as it was on the sweater. Willette won first place as she dazzled the judges as only she can do. Ben Rhone came in at a close second as he showed off his ugly sweater with moves that most of us can't do. All of the judges were bursting out in laughter. It was a lot of fun for everyone. We really appreciate David and Jennifer for opening their house to everyone and for their willingness to go above and beyond for the Church. The 2016 Annual Christmas Card Signing get together was once again held at the home of Pam Galloway. Everyone met together for food, fun, singing and card signing. We really appreciate Pam for opening her home to this event and for being such a good servant for the Lord. The Crockett Road annual Christmas Party was held on December 6, 2016. We had the largest croud that we have ever had at a Christmas party with over 200 of our church family coming to the event. Doug Sumrall provided the meal this year which consisted of barbeque brisket (that would melt in your mouth), smoked turkey, smoked ham, smoked sausage links, two different kinds of potato salad, baked beans, and all the trimmings. We appreciate Doug and his wife, Barbara, for cooking and providing the meal. It was delicious!!! Several ladies of the church brought home made banana pudding for dessert. A big thank you to Sandy and James Singleterry, Audrey Manuel and Willette Rasure for decorating the activity building. It was just beautiful. They worked really hard as well. It was just a great and memorable evening. Willette's daughter provided an edible Strawberry Christmas Tree with all kinds of delicious fruits and chocolate covered strawberries at the bottom of it. It was a great night with great food and great people. We would like to thank all those who worked so hard to make it a night to remember. The church sponsored a "Men's Breakfast" on November 19th which had about 25 men attend. We had a delicious breakfast of scrambled eggs, bacon, ham, sausage, biscuits and gravy. We would like to thank Billy Lane, R.D. Prince, Charles McCullough, George Wooden, and Dwight Franklin for cooking for the group. We had meant to take more pictures, but once the food was cooked, we completely forgot about everything except eating! Everyone had a great time. 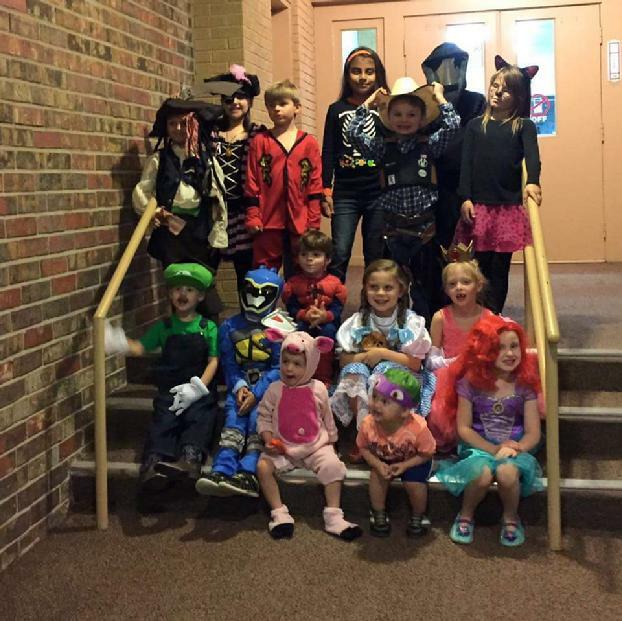 The church hosted a "Trunk and Treat" on Wednesday night, October 26th, for the youngsters. Everyone opened their trunks to allow the children to have candy. Pictured to the left are some of the kids who stayed around long enough to allow a group picture to be taken. The 2016 Fall Fest was held at the home of Clint and Jonna Satterwhite. They were nice enough to once again invite the entire church to their house for a night of fellowship, games, food, and fun! Not only did they invite the church to their house, but they provided a blow up slide for the kids, a hay ride, and cooked hot dogs for everyone. We really appreciate them for all that they do. Everyone had a wonderful time as we enjoyed a beautiful fall evening together. Click on a picture to enlarge it for viewing. The church had a watermelon supper on July 3rd after the evening services. We all enjoyed Pennington watermellons from Grapeland as we visited and ate together. We had a good turnout, and everyone had a great time. It was a lot of fun watching the children eat their watermellons and seeing who could spit seeds the furtherest. On May 15, 2016 the church honored the 2016 graduating seniors with a church luncheon in their honor. This years Seniors are Alyssa Howell, Emma Ricard, Kimmie Dean, and Tanner Gibson. We are very proud of our seniors and wish them well in their future endeavors. We would like to thank George Wooden for providing pictures of the luncheon. The Crockett Road youth participated in the Leadership Training for Christ and were given a sandwich supper in honor of their participation and success after the evening worship service on April 24, 2016. There were 18 youth who participated in the LTC event this year, and they came home with 48 medals for their efforts. The youth group would like to thank Dan & Audrey Manuel, Mandy & Jeff Seale, Willette Mitchell, Destiny & Diane Harding, Amanda Lane, Dale Sparks, Charles McCullough, Kenny Hancock, and Keri Rhone for all they did to help them with the LTC. We would like to thank George Wooden for providing us with photographs of the luncheon. The Ladies Bible Class gave Dan a Birthday Party when they met for their Tuesday Bible Class on March 21st. Everyone had a great time as they celebrated Dan's 30th anniversary of his 39th birthday. We would like to thank Dan for all his years of service to the Crockett Road Congregation and also thank the ladies for providing him with a Birthday Party. After the evening service on February 21, 2016, the Youth Group hosted a Chili Supper & Cake Auction to raise funds for the youth for the upcoming Leadership Training for Christ and Summer Camp. There were 20 entries in the chili cookoff who competed for the title of "Best Chili". The Chili Cookoff winners were: 1st Place - Laura Howell; 2nd place - Jennifer Sparks; 3rd place - Dwight Franklin. The benefit raised around $4000 for the youth. The youth group would like to thank everyone for their contributions and for their support. The 2016 Retirees Valentine's Banquet was held on February 10th in the Activity Building. There were 57 who attended the banquet. The food was great and the company was even better! After the meal, there were several door prizes given away and prizes given to the winners of "The Newlywed Game". Everyone had a great time. On January 23, 2016, The Crockett Road Church of Christ hosted the Annual Give Me Bible Conference celebrating 27 years of broadcasting. The pictures to the left were taken at the conference. We had 27 different congregations represented and also had 27 ministers who attended. Katrina Hillier was presented a plaque for her late husband, Paul Hillier's, contribution to the program as a panelist. It was our largest attendance to date for a Give Me The Bible Conference.